I was impressed by the new Monitor Audio Gold 300 speakers when I auditioned them at the recent Montreal Audio fest. 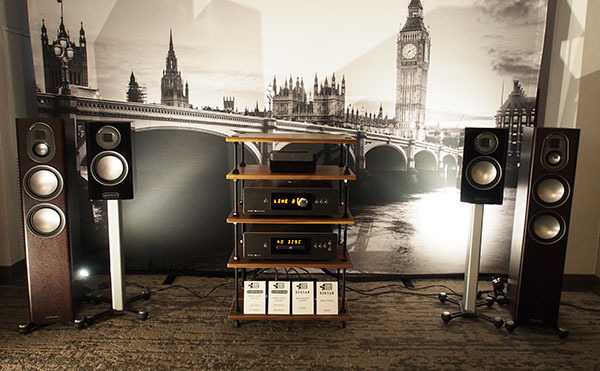 At AXPONA, Chicago retailer Saturday Audio Exchange was showing off the smaller Gold 200 tower ($5000/pair) and Gold 100 bookshelf ($2100/pair) driven by a Roksan Blak integrated amplifier (4499) and Black CD player ($3999) and hooked up with AudioQuest cables. Like the 300, the smaller speakers feature midrange units and woofers that use Monitor Audio’s RDT II (Rigid Diaphragm Technology) sandwich diaphragms, with a “Micro Pleated Diaphragm” tweeter. The sound of the Gold 200s was transparent, with clean high frequencies and well-controlled lows. However, as so often is the case at shows, where the hotel-supplied chairs place the listener’s ears will above a speaker’s tweeter axis, the Monitor Audios sounded hollow unless I slouched.